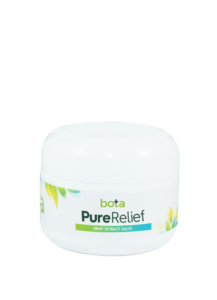 Pure Relief Topical CBD Salve, 500mg delivers pure extracted CBD through your skin and with the addition of lavender, tea tree, and other essential oils provides a pleasant scent to be enjoyed as much as helps. Pure 100% free of pesticides, Non GMO Hemp Oil extract. 500mg Lab tested CBD per 1oz container.